- Register your KIP event here! Please read the terms and conditions before completing your registration. There are a bunch of things that go into being a volunteer host. This is a list of things you should expect to do to make sure that your event gets lots of people, and goes smoothly. To figure out the best location/time/possible discounts/moving tables for the event (when talking to them, give them a number estimate for people, unless you already know - around 10 is a good starting number.) Once you have the owner/manager's permission, put it in writing, and take the paper with you on the event day in case they're not there. Check with the local authorities about permission to set up in a park or on a sidewalk. To do this, go first to your town council building, the attendants there should be able to direct you to the right office. Have with you a piece of paper that details your proposed plans that you can give the person in charge. Once they grant permission, make sure that you have it in writing to show any police officer who's curious on the day of the event. NOTE: Before you do any of the following, make sure you have written permission from the people in charge of your venue location. 3. What should the people bring ? Figure out what knitters will need to bring with them; food, water, (if they're not available at the location), chairs, sun hat, sunscreen, knitting, etc. Also, make note of whether or not there's a bathroom nearby. Put together an indoor back up plan in case the weather goes sour. 5. Put up fliers in your Local area: Local Yarn Shops. 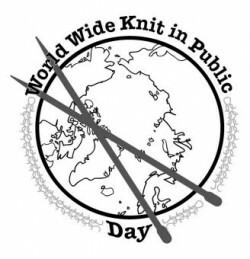 Make a large colorful sign proclaiming WWKIPDay to put outside your venue of choice or inside their window. Make sure that you have permission to do this. Plan on getting to the venue anywhere from an hour to half an hour beforehand to set up/make sure that the things are set up/decorate with streamers etc. You might need to bring chairs and a table to set up in a park. You might have to answer questions from the passer's by about what you're doing, and who you are (a knitter, not really about your particulars, unless you're ok with that). If all of this sounds good to you, then you're ready to sign up. If it sounds like a bit much consider finding a co-host or two who can help out. I know this sounds like a lot of work, but in the end it'll be worth it. Your event will show up on the website 1-3 days after you have registered it. Please make the registration in english or both english/your language in the description of the KiP. Enter relevant directions here - for example, if hosting in a Park, what part of the park? Or, if hosting at your local yarn shop, enter relevant directions here. What are you going to do? Is there a program for the day? A quiz, raffle or competition? Or is it possible to get started as a beginner knitter, etc. Or will you sit on blankets and enjoy knitting together and socialize? Are children welcome etc. Enter relevant things to bring here - such as water, a chair, umbrellas, snacks, etc. Enter information in case the area shouldn't be available (rain out etc.) or you have a backup plan? If not, just say so here. How many times have you hosted a KIP before? Do you want to post an image ? Do you want to post an image? IMPORTANT! max. size 250x600px or 100kb. 25$ - Small business: Local Yarn shop, webshops etc. 25$ - Small Cultural organisations: Libraries, small Festivals, Farmers Market, Fairs etc.